Marvel at the Nation’s Largest Cactus. Saguaro National Park protects the nation’s largest cacti, the giant saguaro cactus, portions of the Sonoran Desert, and two mountain ranges. The park contains two sections – one east of Tucson and the other west of Tucson. President Herbert Hoover designated the land a national monument in 1933. Congress established it as a national park in 1994. Saguaro Park East protects the Rincon Mountain District east of Tucson. It is accessible by the 8.3 mile Cactus Forest Loop Drive. The busiest time of the year is during the winter, from November to March, as the temperatures are cooler. The cactus begin to bloom in late February and March with the Saguaro typically blooming in late April. The Saguaro is the largest cactus in the United States and an iconic symbol of the American Southwest. It takes about 200 years for it to reach a height of 40 feet. At that time, they can weigh up to a ton. The cactus uses its root system to collect water that is in the ground as well as new rainfall before storing it in the interior of the cactus for use during times of drought. The Saguaro only grows in southern Arizona. Saguaro West contains petroglyphs at Signal Hill. This rock art was created by the Hohokam people approximately a thousand years ago. The site is just north of the Signal Hill picnic area via a short hike and contains over 200 petroglyphs. Petroglyphs are carved into the rock surface. King Canyon Trail: A 6.8 mile out and back in Saguaro West that climbs to the top of Wasson Peak, the highest point in this section of the park. Tanque Verde Ridge Trail: This trail is the main route into the backcountry in Saguaro East. It is 11 miles to Cowhead Saddle, but the first two or three miles make for an appealing day hike. Backpacking: There are five trailheads and six backcountry campgrounds in the Saguaro Wilderness Area, which has nearly 60,000 acres of roadless backcountry. Bear-proof containers are available at the designated campsites due to a small population of black bears. Before you set off for an overnight, be sure to plan your water consumption as this is a desert and water can be scarce. The desert isn’t a particularly hot destination for fishing. Most fishing in the area is done at the four urban parks in Tucson which are stocked regularly. The state publishes a stocking schedule and the hottest fishing occurs in the days after the fish are stocked. 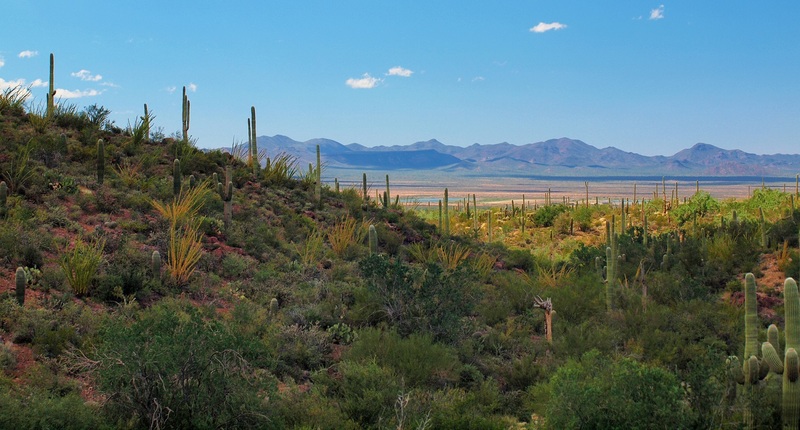 Saguaro National Park does not contain any road-accessible campgrounds. Backcountry camping is available in designated sites with a wilderness permit in Saguaro East. Be sure to plan for your water consumption as only Manning Camp has water available year-round. Road accessbile campgrounds are available in several nearby state and county parks, national monuments and Coronado National Forest. Saguaro is located a short drive from Tucson, Arizona. With a population of around half a million people in the city, there are numerous hotel and otherlodging options within a thirty minute drive of the national park.